Like many beginning photographers, I’ve been a long-time fan of zoom lenses throughout much of my four year photography career. This past year, however, something in my brain shifted and I began to first accumulate and suddenly prefer using prime lenses. I began with the humble Canon 50mm f/1.8, eventually adding a 100mm f/2.8 macro lens. For many months, this combination of lenses paired with my Canon 6D became my preferred travel photography kit, replacing my beloved 16-35mm f/2.8. I loved the compact, significantly lighter kit that I was now able to tote around in my discrete Kata DSC 437 camera bag. Several weeks ago, I decided to pull the trigger on another prime lens: the Canon EF 40mm f/2.8 STM pancake lens. 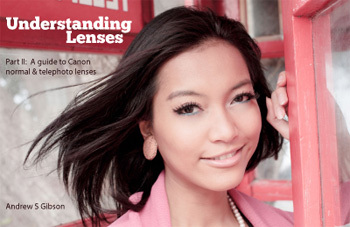 Announced by Canon in June 2012, this is a relatively new lens and is the smallest ever made by Canon. 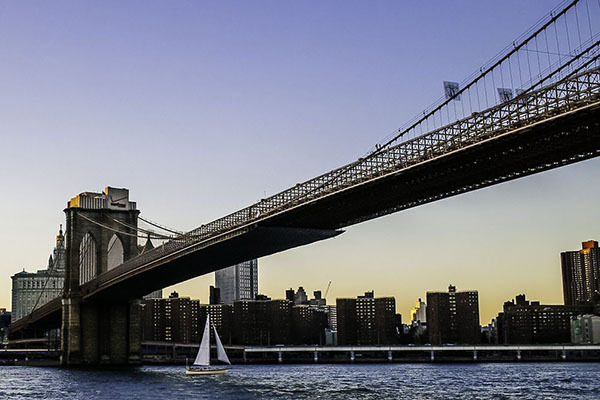 Intrigued by its smaller size and slightly wider focal length, I decided to use it in place of my nifty fifty lens on a two week trip to New York and Montreal. The resulting images I took and overall experience shooting with the 40mm have secured it as my favorite new all-around shooting lens. Here are some reasons why you too may want to consider adding the 40mm pancake lens to your collection. At 22mm (0.86″) deep, the 40mm is significantly shorter than the 50mm f/1.8, which measures 41mm (1.6″) deep. The 40mm’s shortened length makes it easy to slip it into a relatively small camera bag, or even a medium sized purse. 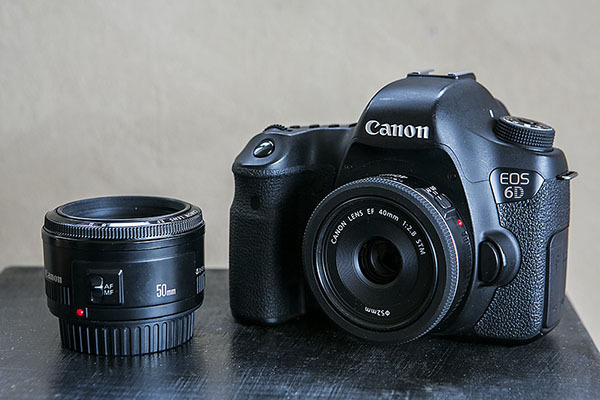 While the 40mm will work on every Canon DSLR ever made, it is optimized for use on full-frame digital cameras. I always found 50mm to be slightly too long for most of the casual street photography or travel shots that I want to take, and Canon doesn’t make a 35mm for less than $500. Priced brand new at $199.99, the 40mm is the perfect balance in terms of focal length and cost, providing an incredibly natural perspective to images at a reasonable cost. Despite being drastically shorter than the 50mm f/1.8, the 40mm actually weighs about the same at 4.6 ounces (130 grams). This is likely due to the 40mm being constructed of both metal and plastic, giving it a very solid and secure feel, especially when compared to the mostly plastic 50mm f/1.8. 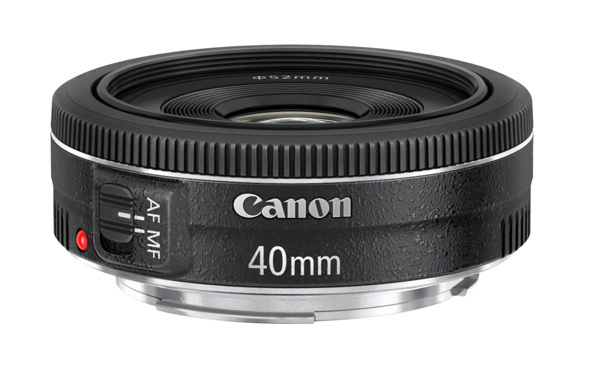 Like the 50mm f/1.4, the 40mm also has an outer focus ring that can be adjusted at any time for instant manual-focus override when shooting in Canon’s One Shot focus mode. The 40mm’s compact build makes it very easy to stow in casual bags of nearly any size. Its size also makes it more inconspicuous, making it ideal for street or documentary photography, as opposed to the popular 24-70 f/2.8 lens, which always seems to stick out. 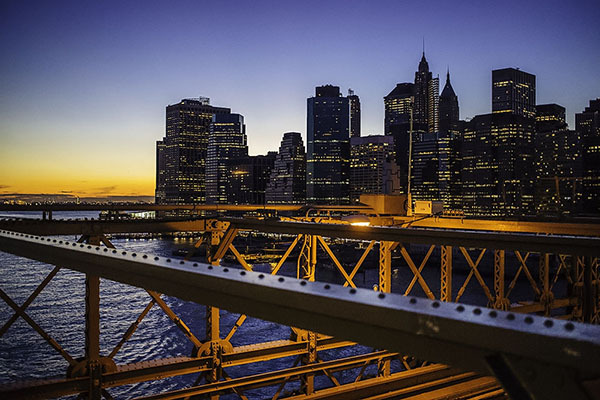 My travels through New York and Montreal saw many tall buildings and skyscrapers which were admittedly harder to shoot with the 40mm, making me miss my wider 16-35mm. 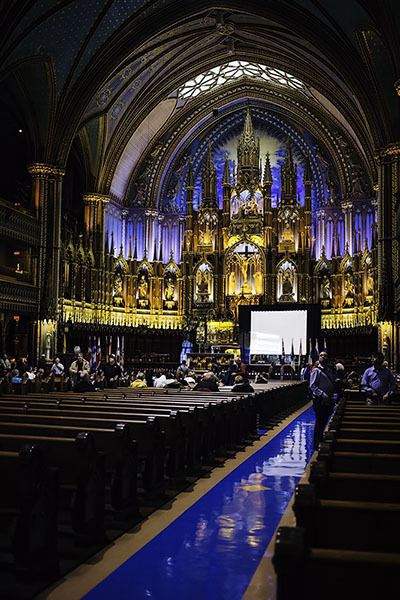 However, the 40mm was still wide enough to capture certain architectural scenes, and the benefit was the lack of distortion when captured at 40mm versus 16mm. This meant far less lens correction in post-processing. 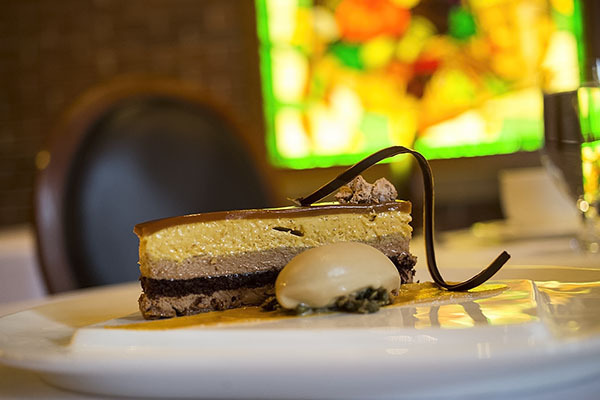 Another area of photography that is immensely easier with the 40mm is food and drink photography for the casual shooter. If you want to make less of a show of grabbing a few snaps of a dish while being seated at a restaurant, the 40mm’s wider focal length and minimum focusing distance of 0.3m (11.8″) – compared to 0.45m (17.7″) on the 50mm f/1.8 – is perfect for capturing what is immediately in front of you without having to stand up and fuss with angles. Throughout my three weeks of shooting with the 40mm, I had only one minor complaint that to me is the compromise of having a slimmer lens: lack of space to properly handle the lens during lens changes. It is much harder to attempt spur of the moment lens changes without accidentally getting fingerprints on one side of the lens or potentially dropping it. 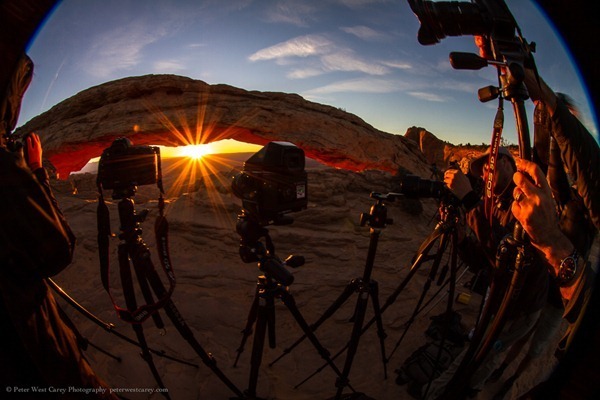 Do you have a favorite lens? Have you tried this little gem? Share your thoughts in the comments. The post Writer’s Favorite Lens – the Canon 40mm Pancake Lens by Suzi Pratt appeared first on Digital Photography School. Andrew S. Gibson is the author of Understanding Lenses Part II: A Guide to Canon Normal & Telephoto Lenses, on 40% now at Snapndeals for a limited time only. With so many lenses to choose from, it’s little wonder that photographers become confused about which option is the best. In this article I’m going to take a look at some of Canon’s best or most interesting normal and telephoto lenses, to give you a head start when it comes to understanding just what Canon offers in this part of their lens range. But first, let’s take a quick look at the state of Canon’s lens line-up. I have no inside knowledge about which lenses Canon may introduce this year, but I do see a couple of emerging trends. The first is that Canon is not afraid to take an old lens and update it with a newer version. Good recent examples are the new EF 24mm and 28mm f/2.8 IS USM lenses. Both replaced older versions and included an Image Stabilizer (IS) which the previous models didn’t have. The second trend is that newer lenses tend to be more expensive than the ones they replace. This is reasonable, as the newer lenses are better quality. If a new lens comes out and it seems expensive, you can be patient and wait a year or so for the price to drop if you don’t need it urgently. 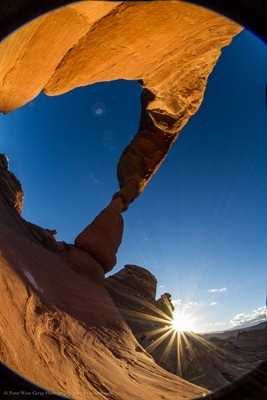 The two wide-angle lenses mentioned above have dropped in price by over 30% since their release. That does mean it is possible that Canon will replace some of their aging normal and telephoto lenses in the near future. If you’re thinking about buying one and are worried about this, it’s up to you to decide how badly you need the current version. While the rumour websites like to speculate about forthcoming lenses, and are sometimes accurate, you never really know what will happen as Canon keep the details of new releases under wraps until the official day of release. A good example of this is the EF 50mm f/1.4 lens. Some rumours sites are saying this is due for an update. But if this is true, and how far in the future it will happen, no-one really knows. Plus the replacement is likely to be more expensive than the current 50mm f/1.4 lens (but it may have IS). In the end, it’s up to you, but my advice is don’t spend too long waiting for new lenses – you could be waiting a long time. 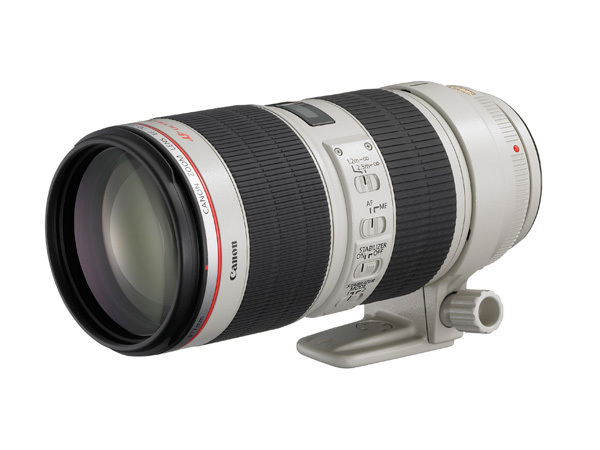 Canon EF 200-400mm f/4L IS USM – the beast! 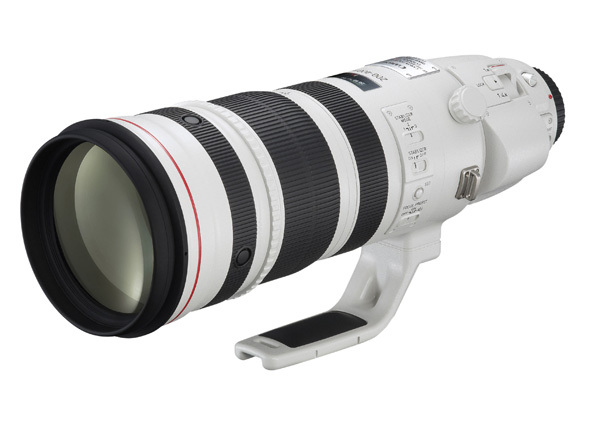 Canon EF 200-400mm f/4L IS USM Extender 1.4x - only about $12,000 USD! Let’s start off with this beast. It’s fun to speculate who would buy such an expensive lens. A professional sports photographer? Agencies like Getty or Reuters? This L series, super telephoto zoom, comes with a built in 1.4x extender (the only Canon lens to do so), a four stop Image Stabilizer, and a fixed f/4 aperture throughout the zoom range. It weighs over three and half kilos (7.9 pounds), but is not Canon’s heaviest lens. 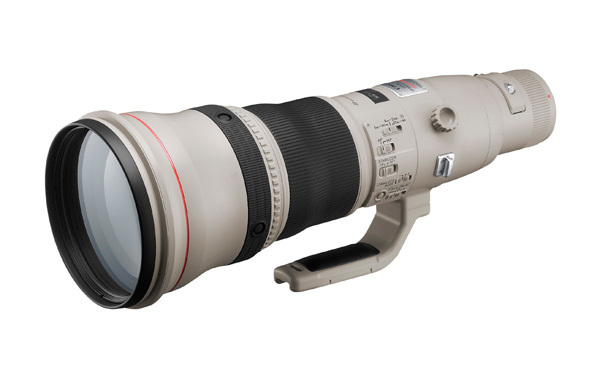 That honour belongs to the Canon EF 800mm f/5.6L IS USM lens (below), which weighs four and half kilos (9.9 pounds) and is another option for those of you with $13,000 to spend on new glass. At the other end of the scale is one of Canon’s lightest, smallest and least expensive lenses. This 40mm pancake lens delivers excellent image quality, and excellent value for money. However it doesn’t have IS or a distance scale on the lens, features which may be important to some people. How does this lens give such excellent quality for such a low price? It contains just six optical elements that measure little more than a centimetre across (0.4″). They are cheaper to manufacture than the larger elements found in Canon’s other lenses, and the result is a lower price. This focal length is a short telephoto on an APS-C camera or a normal lens on a full-frame camera. Canon users aren’t lacking for choice when it comes to 50mm lenses. Canon makes four models, including the 50mm f/1.8, the 50mm f/1.2L and 50mm f/2.5 macro. 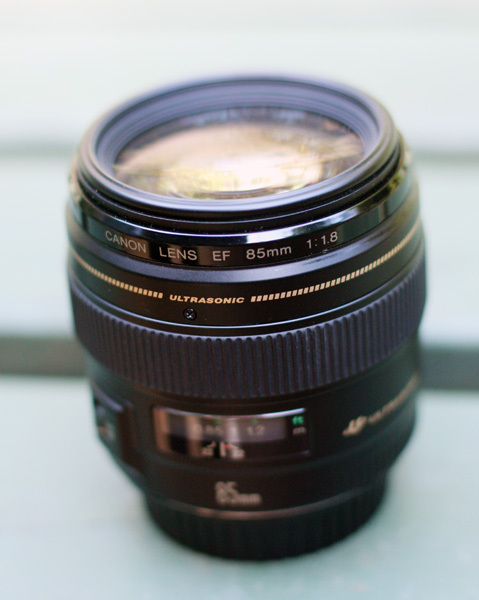 But my favourite is the EF 50mm f/1.4 USM. It’s a third of the price of the more expensive L series 50mm lens, but has better autofocus and smoother bokeh than the f/1.8. 50mm lenses make great portrait lenses on APS-C cameras and deliver value for money in terms of image quality and versatility. 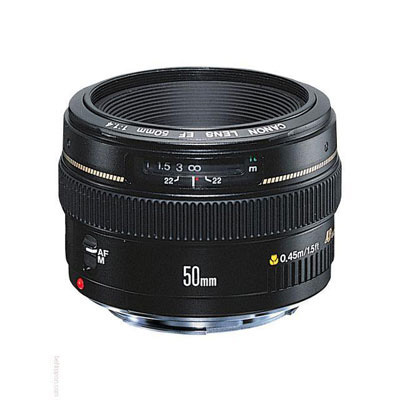 You can use a 50mm lens with extension tubes or close-up lenses for close-up photography, or with a reversing ring on a longer lens for macro photography. 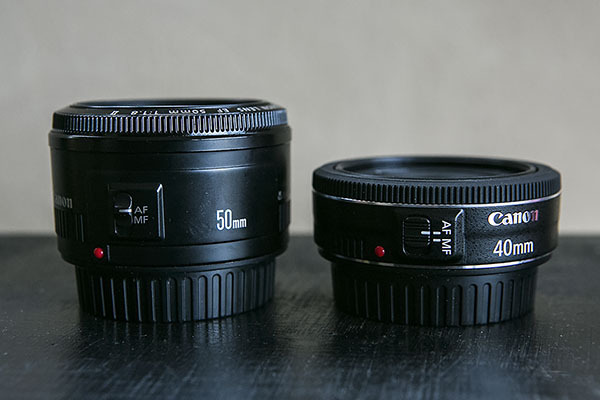 Read more about 50mm lens in my article Nifty Fifties – Why I Love 50mm Prime Lenses. Another of my favourite lenses is the 85mm f/1.8. It’s an ideal portrait lens for owners of full-frame cameras. It’s also great for close-up photography with the addition of a 500D close-up lens. It’s a shame it doesn’t have IS, but that would push the price up. If you have deep pockets you can also consider the EF 85mm f/1.2L II USM lens, but bear in mind the wide f/1.2 aperture means it has a large front element (to let in the more light) and that makes the lens heavier and slower to autofocus. Read more about this lens in my article How a Humble 85mm Lens Became My Favourite. Canon has four 70-200mm zoom L series lenses. Two of these have maximum f/4 apertures and cost less. The other two have maximum f/2.8 apertures. For each aperture setting there is both a non-IS and an IS model. 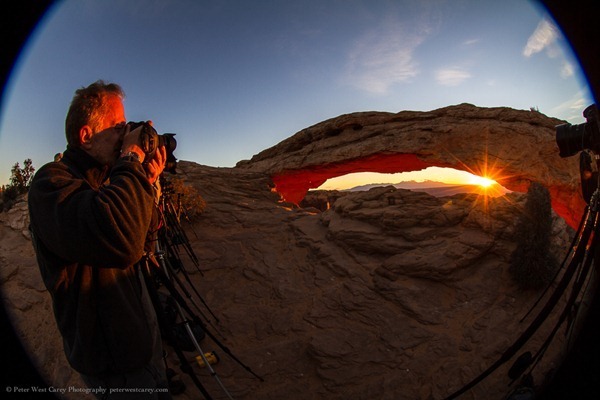 This gives you plenty of choice, for what is a very versatile focal length. The EF 70-200mm f/4L USM lens is Canon’s cheapest L series lens and a great option for anyone wanting to experience L series quality on a low budget. The EF 70-200mm f2.8L IS II USM (above) is the most expensive and comes with a collar so you can mount it on a tripod. If 200mm isn’t long enough for you then Canon’s trio of 70-300mm zooms may appeal. The only drawback of these lenses is the variable aperture, but it’s hard to avoid this along such a long focal length range. 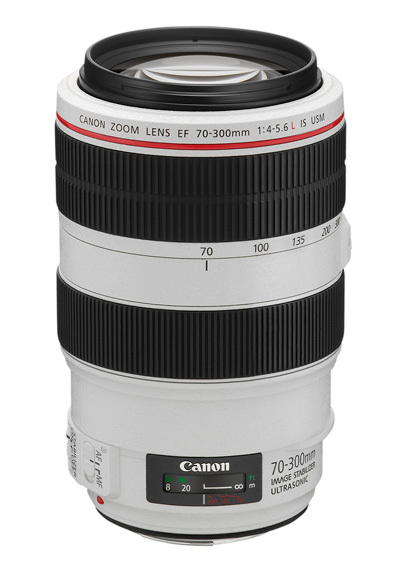 The EF 70-300mm f/4-5.6L IS USM is the most recent model, but also the most expensive. The EF 70-300mm f4/-5.6 IS USM lens is the least expensive and ideal for those on a tight budget. The EF 70-300mm f/4-5.6 DO IS USM lens is an interesting alternative. DO stands for Diffractive Optics. The construction of the lens elements in DO lenses means they are smaller and lighter than their non-DO equivalents, making this a good option for photographers concerned with size and weight. In every other respect DO lenses are equivalent to L series lenses. Will Canon make more DO lenses in the future? I hope so, because they are a great idea. 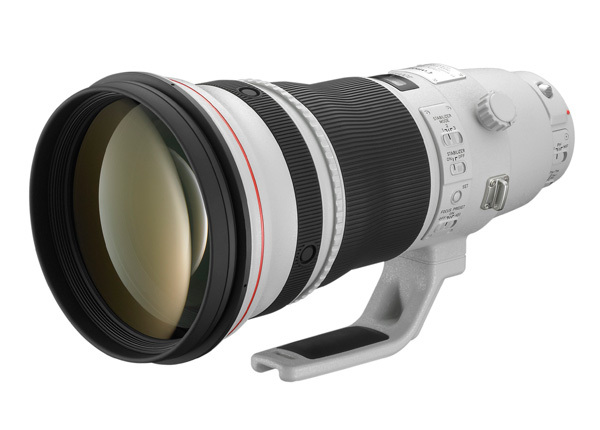 The only other DO lens in Canon’s range is the EF 400mm f/4 DO IS USM. Hopefully that has given you a good overview of some of Canon’s more notable normal and telephoto lenses. It’s impossible to include every model, let alone those made by other manufacturers, but that’s where you come in. 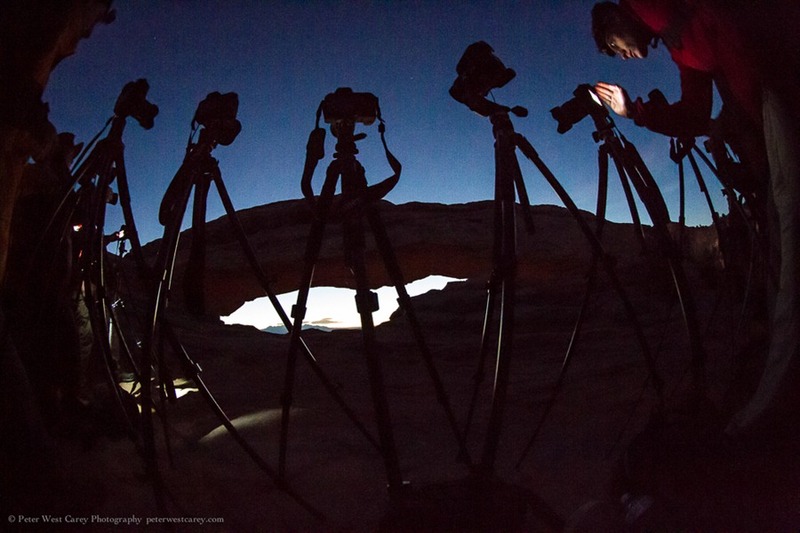 What normal or telephoto lenses have you purchased? How have they performed and what would you recommend? Let us know in the comments. My ebook Understanding Lenses Part II will teach you how to get the most out of Canon’s normal and telephoto lenses. It contains a buying guide, takes a deep look at aperture and bokeh, and shows you how to focus accurately with telephoto lenses. It’s offered for a special price now on 40% off at Snapndeals for a limited time only. The post A Buyer’s Guide to Canon Normal and Telephoto Lenses by Andrew S. Gibson appeared first on Digital Photography School. 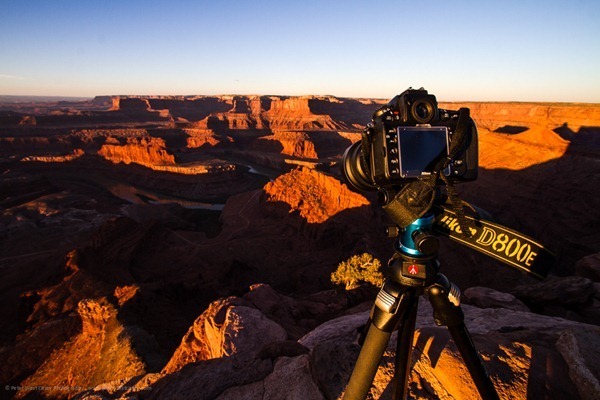 Here’s a quick tip for Canon 5D MkIII users. If you don’t use this camera, this tip probably isn’t very helpful for you. 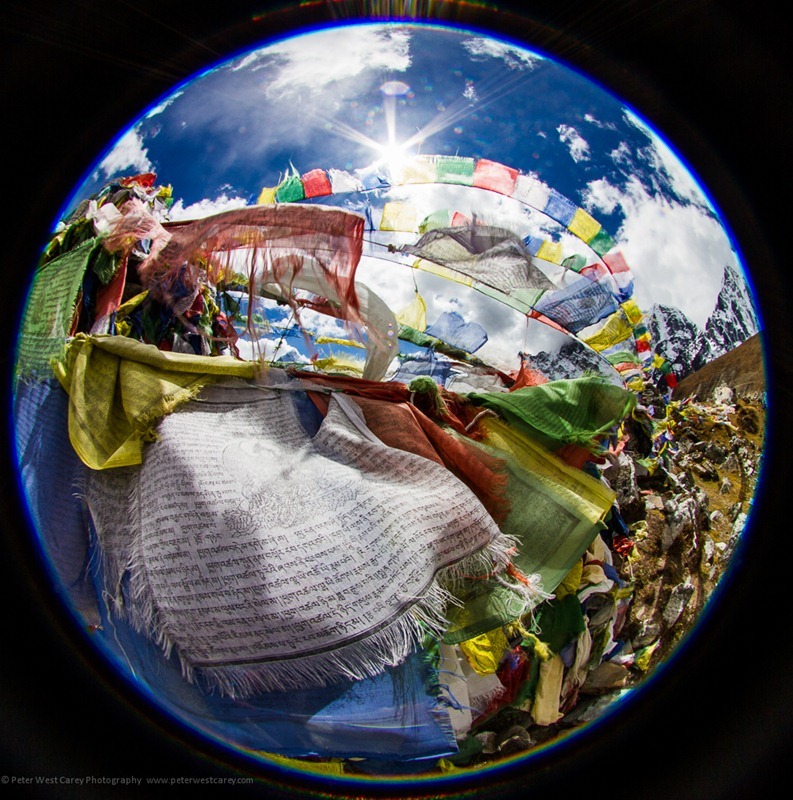 Instead you might be interested to read about how I shot the above photo. Also, I recommend skimming through your camera manual to see what customizations are available. Customizing your camera’s button configuration can help taylor the camera to your shooting style. 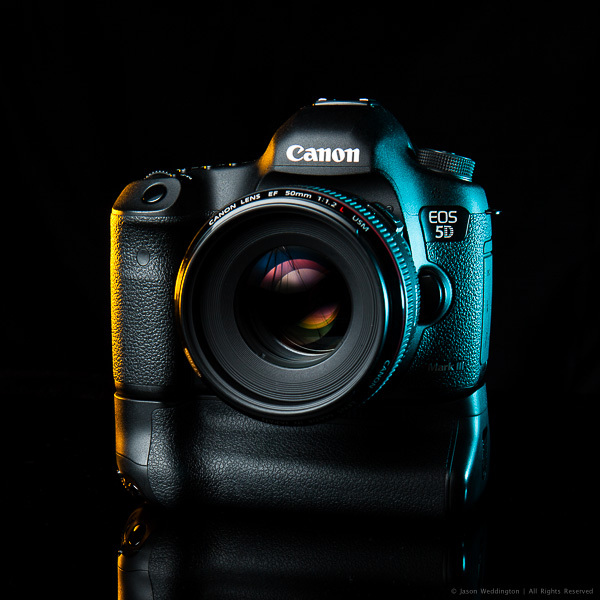 With the 5D Mark III, Canon added the ability for users to change the function of several of the buttons on the camera body. In addition to this new functionality, Canon also moved the Depth of Field (DoF) preview button. It’s now on the left side of the lens, in approximately the 8 o’clock position, as you look at the camera’s front. This customization allows me to stay in Single Shot AF mode, and toggle Ai Servo focus with my right ring finger if my subject starts moving. This is an incredibly flexible way to handle moving subjects and I like being able to toggle between two AF modes without moving the camera from my eye. Give this a try and let me know how you like it. It took me a couple weeks to train myself to use my ring finger to toggle Ai Servo, but now that I’m used to it, I love shooting this way. As always, you can find me on Facebook. 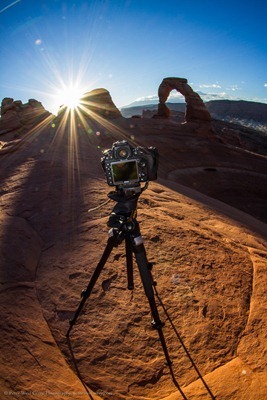 Post originally from: Digital Photography Tips. 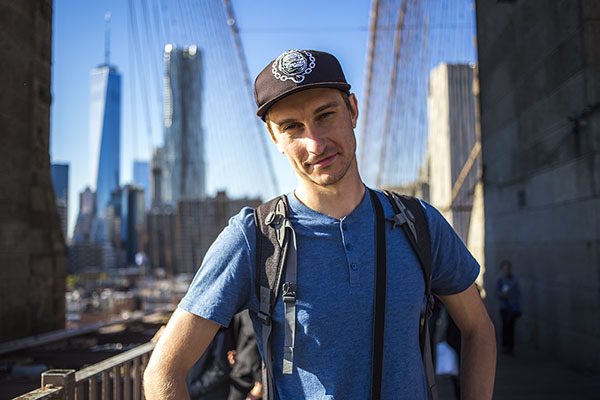 Check out our more Photography Tips at Photography Tips for Beginners, Portrait Photography Tips and Wedding Photography Tips. 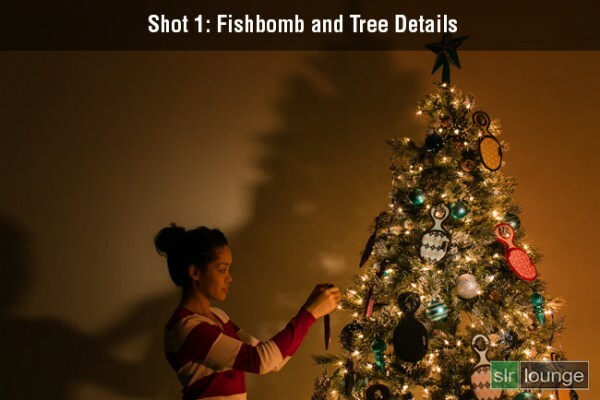 Anyway, because the Fishbomb is shaped like a Christmas tree ornament, I decided to decorate a Christmas tree with the Fishbombs and shoot our model, Maria, placing a Fishbomb on the tree. Here is the final image we will be working towards. If you are interested in watching the full behind the scenes video on the SLR Lounge YouTube Channel, here is the video below. 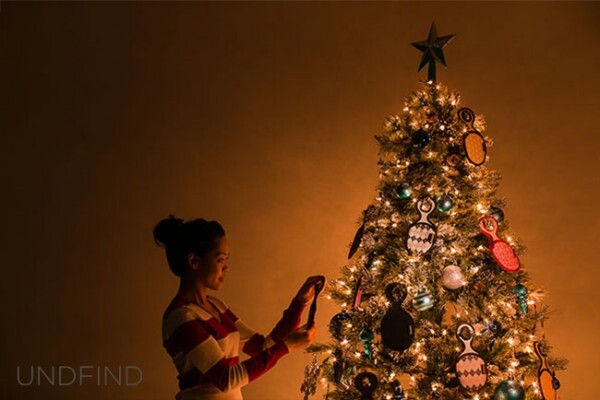 The biggest challenge that I encountered was how to light the Fishbombs in addition to lighting Maria, the Christmas tree, and the environment. The Christmas lights were used to light Maria and the environment. However, when we hung the Fishbombs on the tree, we noticed that the front of the Fishbombs were not illuminated by the Christmas lights. This meant that we had to light the Fishbombs using another light source; I selected an LED light with an adjustable temperature so that I could color match with the tree’s natural Christmas lighting. However, I ran into another problem. The LED light was casting a harsh shadow against the wall which destroyed much of the warm, ambient light from the Christmas tree as you can see in Shot 1 below. 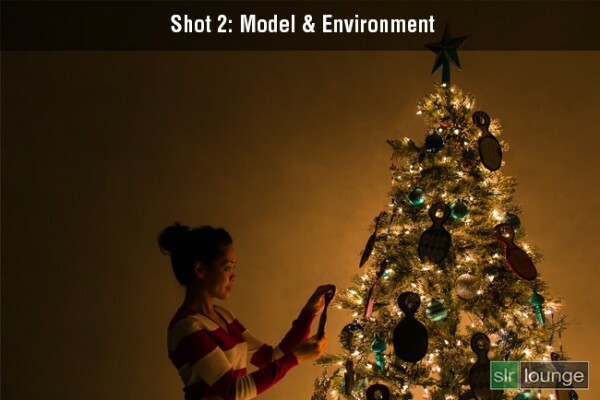 The easiest way to solve this lighting issue was to light and shoot two separate images, one for the model and the environment, and the other for the actual detail on the Fishbombs and the tree. Afterwards, we can composite both images together in Photoshop via layers. For each shot, I had the camera placed on a stationary tri-pod to make it simple to combine both layers into our final composite. So let’s look at how I shot each image. 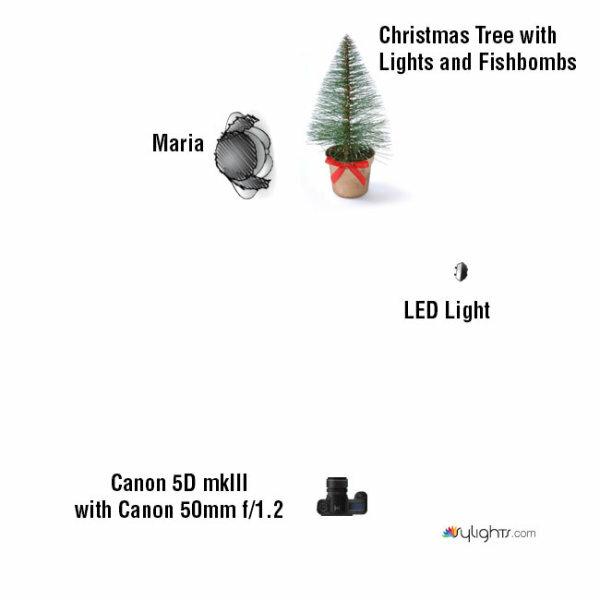 For the first photo, I lit the Fishbomb and the front of the Christmas tree with the LED light. I also dragged the shutter speed and used the smallest aperture possible in order to get a twinkling/starburst effect from the Christmas lights. I didn’t have to worry about any camera shake because the camera was on a tripod and was triggered with a shutter release. The tree and the ornaments were completely still as well since we were in a closed environment. This image was lit strictly by the lights on the Christmas tree. Because I want to minimize any motion blur with the model, a quicker shutter speed was required. Therefore, I used a wider aperture and a higher ISO in order to attain a shutter speed of 1/8 seconds. Even then, I still had to ask Maria to hold completely still during the photo to prevent any motion blur. In Lightroom, I applied the Soft Portrait preset from the SLR Lounge Lightroom 4 Preset System to both images. Additionally, I shifted the Tint and the Temperature in order to add a warm, intimate glow reminiscent of a fireplace. Once I achieved the look that I wanted, I exported the two images into Photoshop via layers for compositing. In Photoshop, I used layer masking to reveal the Fishbombs and the tree details from the first image over the second image of Maria and the environment. After a little bit of clean up in the hair and the cloning of an extra branch to the top of the tree, this is how the image looks. Hope you all enjoyed this article! If you are interested in picking up some Fishbomb’s for stocking stuffers, the deal is available on UNDFIND’s Camera Bags website through the end of the year. There are few things better in life than having something go wrong that leads to the discovery of something even better. Such is the case with my plan to test out a Canon 8-15mm fisheye lens courtesy of BorrowLenses.com. 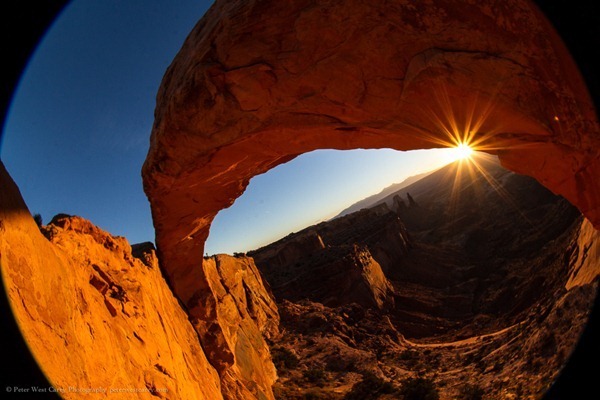 My intent with the lens was to take it with me to the wilds of Arches and Canyonlands National Parks in Utah for some crazy, circular images. The problem is I lack a full frame Canon camera, but would be traveling with Michael Riffle, who owns a Canon 5D Mark III. He accepted the challenge to test the lens, being familiar with fisheyes himself. One thing led to another and we never got around to testing the lens on his camera. Instead, I often found myself using the lens on my Canon 7D, a crop sensor camera. 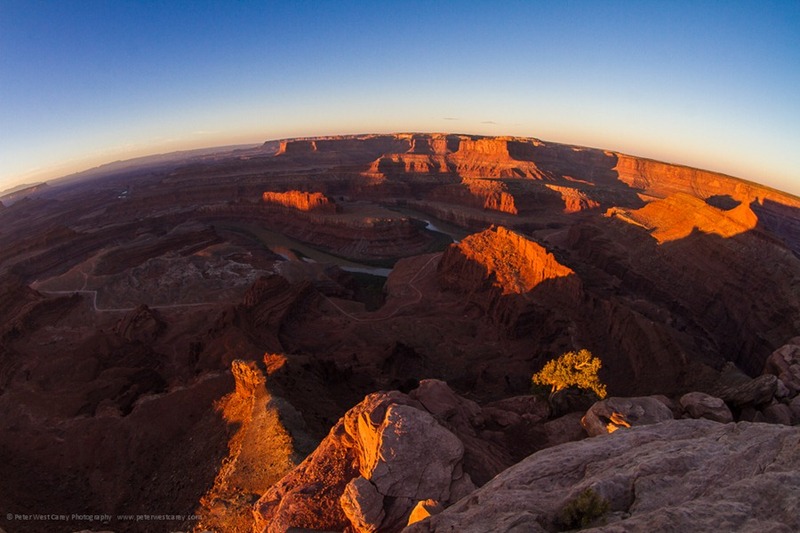 The Canon 8-15mm is intended to fit a full frame sensor and produce, at 8mm, a fully circular image, much like this example from a Sigma 4.5mm on a crop sensor camera. 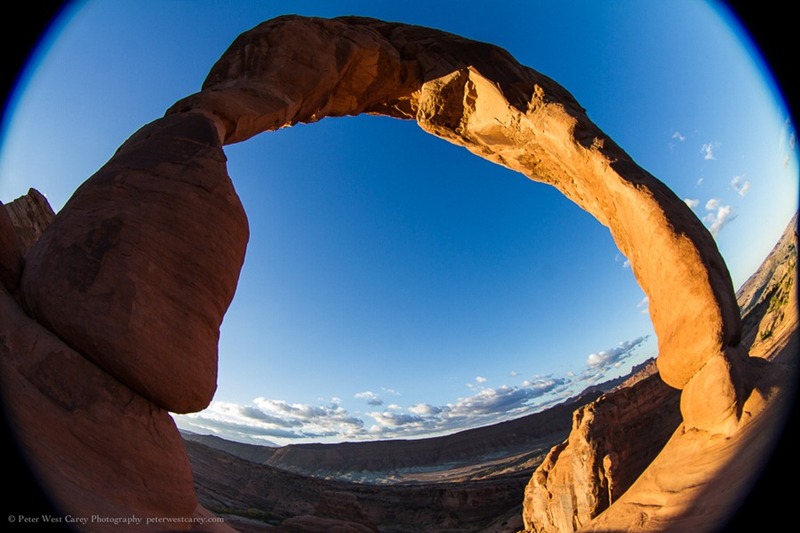 What happened instead was a cross between this full circle and a more traditional 15mm on a crop sensor. The 8-15mm lens will show edges of the circle when below 10mm but will otherwise fully cover the sensor from 10mm-15mm. A major difference from a non-fisheye lens, though, is the curving in the image. 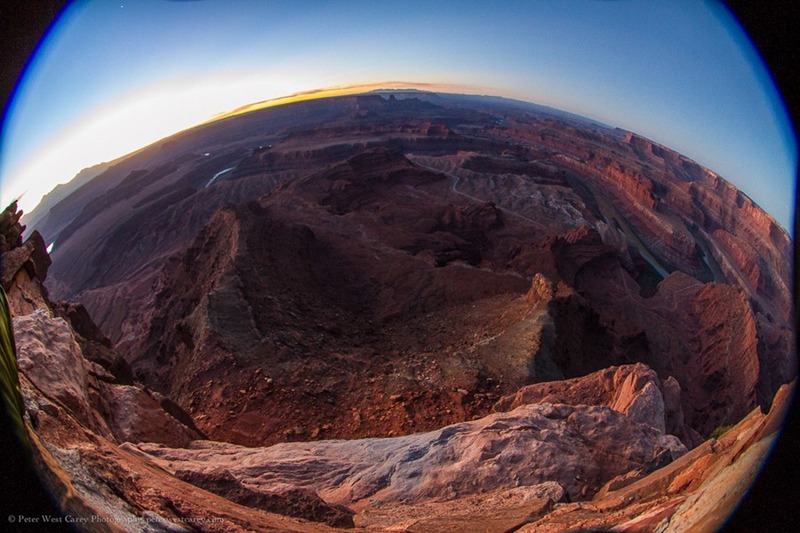 For instance, here are two shots, both taken at 10mm. 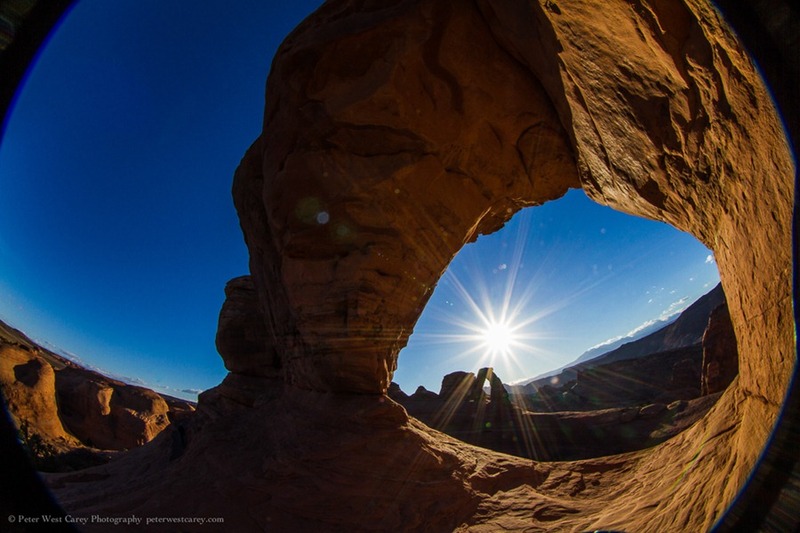 The difference: the first lens is a non-fisheye Canon EF 10-22mm lens and the second is the Canon 8-15mm fisheye. Both shots are taken from nearly the same perspective (the fisheye is taken from the position of the Nikon D800E in the first image) but the fisheye gives a different feel. I only made slight clarity and level adjustments in the photos and did not crop them, so this is what you can expect at 10mm. Below 10mm the black edge of the area outside the fisheye is seen. How bad is it? It depends. But then I started finding instances where it worked well. 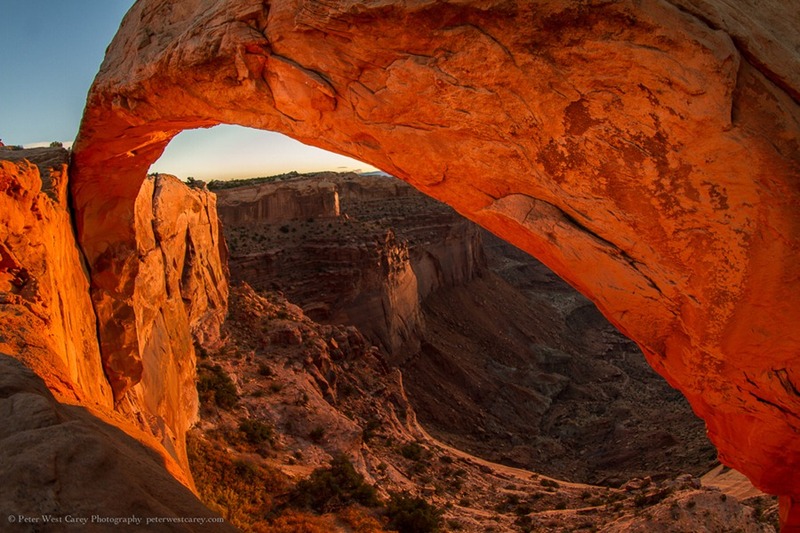 The arches found in these parks lent themselves naturally to the form factor. The more I experimented, the more I enjoyed the effect. I realize not everyone will like this look. By the time you read this, there might be a dozen notes in the comment section below stating how horrible it is. But this is photography and it is art, so it doesn’t really matter what I like or the commenters like. It matters what you like. Below are more examples from my short trip. If they intrigue you to give the lens a try, all the better. Some have the corners blacked out and some are zoomed in slightly. Experiment, play, have fun. 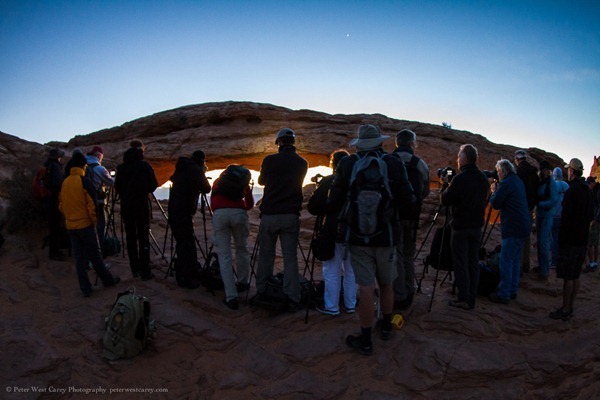 The first set of images are from Mesa Arch in Canyonlands NP at sunrise which was packed with 20 or more photographers. The second set is from Delicate Arch in Arches NP at sunrise with absolutely no one else around. A special thank you to BorrowLenses.com for giving me the chance to play with the lens. A Lead Bag For My DSLR?